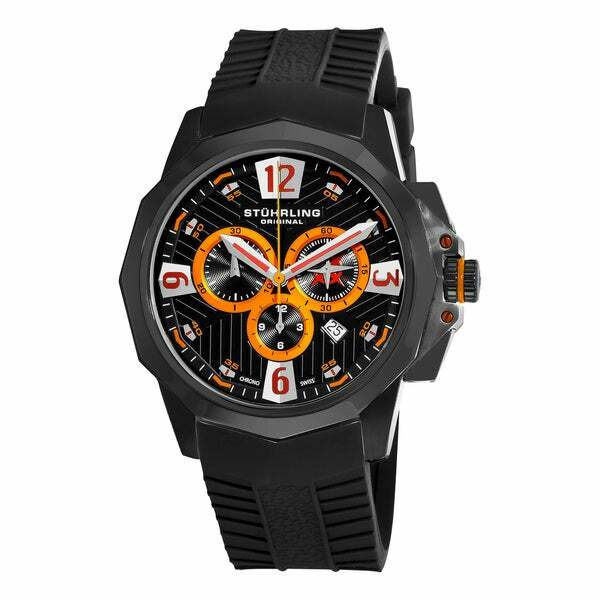 This sporty yet classy Stuhrling Original timepiece is a trustworthy companion that boasts solid stainless steel construction with a classic, masculine design. The Commander includes a quartz chronograph movement and is water resistant to 100 meters. This watch has a screw-down crown (knob) for setting the time. Screw-down crowns create a stronger seal against the case than a push-and-pull knob, giving the watch a greater water resistance factor. To unscrew the crown, grasp the knob and turn it counter-clockwise (towards you) a number of times until it releases. Then pull or push the crown into position to set the time, date, and other functions. To close the crown, press it against the case while turning in a clockwise direction.